Delving into the 2018 BosWords Puzzles! I finally had a chance to sit down and take a crack at the puzzles from the BosWords Crossword Tournament last month. Given the talent involved amongst the organizers, I had high expectations, and I was not disappointed. So let’s put those puzzles under the microscope and see what’s what! This unscored opening puzzle is a nice warm-up, getting everyone into the puzzly spirit and ready to solve. The revealer (INSIDE JOKE) explains the simple hook — words and phrases containing synonyms for “joke,” a la ACU”PUN”CTURE — and the easily-accessible fill entries make this puzzle a breeze. Interesting grid entries included ZINN, YUAN, THE OC, and FAMOUS AMOS, and my favorite clues were “Ocean liner?” for SHORE and “Ending with ‘buck’ or ‘stink’” for AROO. For the second year in a row, Laura Braunstein constructed the opening puzzle of the tournament, and once again, she delivers a picture perfect appetizer for a day of solving. The cluing feels fresh and relevant, and the theme — phrases with a chilly starter, like ICY RECEPTION — is instantly gettable without feeling hackneyed or overdone. The grid fill is fun with hardly any crosswordese. A terrific start for the event. Interesting grid entries included AIR GUITAR, TACO TRUCK, LISZT, and DOODAD, and my favorite clues were “Medieval peasant (no, not ESNE! )” for SERF — a nice reference to common crosswordese there — and the pairing of “Much ____ About Nothing” for ADO and “‘Much ____ About Nothing’ (1996 ‘The Simpsons’ episode)” for APU. This puzzle puts an interesting spin on the classic moniker for Saturday Night Live cast members by casting athletes from Boston-based teams whose jersey numbers are not prime numbers. (For instance, BOBBY ORR is “Bruins #4 who is an NHL and crossword legend.”) Although you need to know your Beantown sports figures for this one, the accessible fill makes it easy to cobble the names of the athletes together if sports isn’t your strong suit. Interesting grid entries included BALL PIT, MASTER YODA, OPIUM, and BLUE MAN, and my favorite clues were “What this is” for PRONOUN, “What this entry isn’t” for ACROSS [this was a down clue], and “‘The Fast and the Furious’ films, e.g.” for OCTET. But the theme entries were very clever, concealing famous musicals within mashup entries — TRENTON OF BRICKS, which is TON OF BRICKS with RENT inside, for instance — all of which spanned the entire grid as 15-letter answers. Another topnotch grid and concept from one of the best. Interesting grid entries included CUT BAIT, AFLAC, MINSK, and K-SWISS, and my favorite clue was “Like the main characters in ‘Scooby-Doo’” for NOSY. 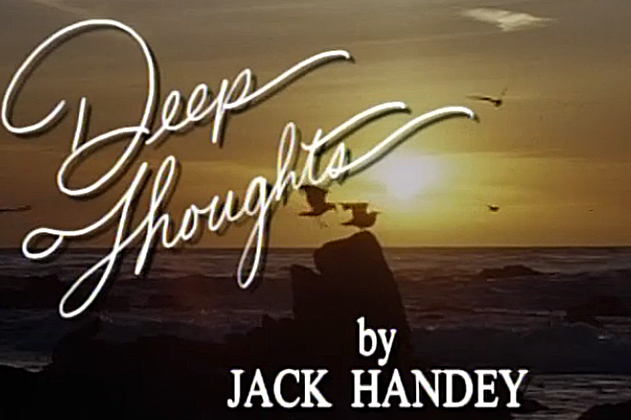 But those missing IDEAs — the “deep thoughts” of the title — were also missing from the theme entries, so EUCLIDEAN GEOMETRY had to be written into the grid as EUCLNGEOMETRY. It was diabolical, and a masterful example of gridplay at work. Interesting grid entries included BANTU, MAJORCA, ADONAI, MY BABY, and ROPE RUG, and my favorite clues were “Buster’s target?” for MYTH and “HAL 9000 adversary” for DAVE. The tournament concluded with a fun, punny hook, as Vigeland paired six celebrity guest hosts with descriptors to create common phrases like VOLCANIC (Chris) ROCK and BURNED (Jeff) BRIDGES. After the challenge of Puzzle 4, this was a pleasant solve that still made you work for some of the obscure fill entries. Interesting grid entries included TIMESUCK, FBI AGENT, EBATES, and I GOTTA GO, and my favorite clues were “The Great Wall of China is visible from space, e.g.” for MYTH and “Deal breakers?” for NARCS. This well-constructed tiebreaker puzzle abandoned the SNL theme for a sci-fi twist, and the resulting puzzle was very smooth, combining a good hook — eight phrases consisting of two B words — with a clever revealer: beloved Star Wars rolling droid BB-8. Although not strictly part of the tournament puzzles in either point value or style, this was a fun puzzle all around. Interesting grid entries included MR. DARCY, OPEN BAR, BOO BERRY, and ACADIA, and my favorite clue was “Like inside-the-park home runs” for RARE. The grand finale of the tournament was this fairly tough puzzle with lots of long entries crossing and some difficult cluing. Although well-constructed — particularly the corners with intersecting 8- and 9-letter entries — the inclusion of answers like H-TILE and ECON EXAM felt like a little bit of a cop-out, compared to the otherwise tight grid construction by the usually impeccable David Quarfoot. Still, this outdid Puzzle 4 for toughest overall solve for the tournament. I don’t think I would have completed it in the time allotted, let alone fast enough to do well against fellow solvers. Interesting grid entries included CHEMTRAIL, BOSOX, ARIOSO, TRAVEL BAN, and NEVERLAND, and my favorite clues were “Fitting position?” for TAILOR and “Pill-dropping alternative to Tetris” for DR. MARIO. Overall, I would call this year’s array of tournament puzzles a rousing success. They clearly had fun with the Saturday Night Live-inspired hooks, and the puzzles were challenging and creative in their fill without being intimidating or getting too esoteric. BosWords is probably the most new-solver-friendly tournament out there in terms of puzzle difficulty — not nearly as challenging or as experimental as those at Lollapuzzoola or The Indie 500 — while still remaining engaging. It’s the right mix of challenge and creativity for solvers accustomed to NYT-style solving, and I think the constructors and organizers did one heck of a job putting together the tournament. Can’t wait to see what they cook up for us next year. This Weekend: Puzzly Tournaments and Film Debuts! This Sunday, July 29, from noon to 5 PM, puzzlers from all over will gather at The Roxbury Latin School in West Roxbury, Massachusetts for the second annual BosWords Tournament! With three divisions to choose from — Expert, Amateur, and Pairs — puzzlers of all ages and experience levels will have the opportunity to test their puzzly wits. The four themed puzzles in regular competition have been constructed by Laura Braunstein, Andrew Kingsley, John Lieb, Joon Pahk, and Brendan Emmett Quigley, and after the scores from those puzzles are tabulated, a championship themeless crossword by David Quarfoot awaits the top three solvers in each division! BosWords is asking for $20 for adults, $20 for pairs, and $10 for students to attend and compete, which is a real bargain!. You can check out their Facebook page for full details! But that’s not all that’s happening in the world of puzzles this weekend! 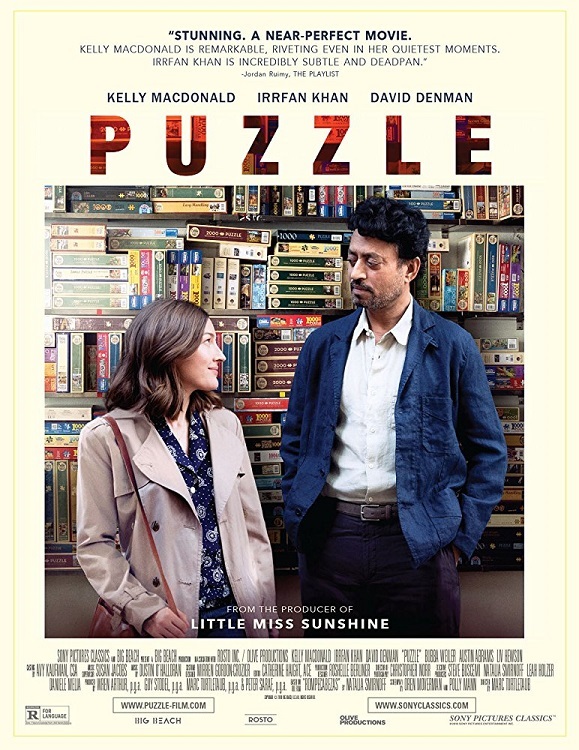 Yes, the film Puzzle opens today in select theaters! The film stars Kelly MacDonald (who you might know from Brave, Boardwalk Empire, Gosford Park, or Trainspotting), Irrfan Khan (Life of Pi, Slumdog Millionaire, In Treatment, and Jurassic World), and David Denman (The Office, Angel, 13 Hours, and Logan Lucky). The plot focuses on Agnes, a suburban mother taken for granted by her husband and family, who discovers a passion for solving jigsaw puzzles. This newfound passion unexpectedly draws her into a new world – where her life unfolds in ways she could never have imagined. Will you be attending the BosWords tournament or hitting the theaters to watch Puzzle, fellow puzzlers and PuzzleNationers? Let us know! We’d love to hear from you! The BosWords Crossword Tournament Returns Soon! Sunday, July 29th, from noon to 5 PM, puzzlers from all over will gather at The Roxbury Latin School in West Roxbury, Massachusetts for the second edition of the BosWords Tournament, and registration opens today! With three divisions to choose from — Red Sox (Expert), Paw Sox (Amateur), and Pairs — puzzlers of all ages and experience levels will have the opportunity to test their puzzly wits. The five themed puzzles in regular competition have been constructed by Laura Braunstein, Andrew Kingsley, John Lieb, Joon Pahk, and Brendan Emmett Quigley, and after the scores from those puzzles are tabulated, a championship themeless crossword by David Quarfoot awaits the top three solvers in each division! Will you be attending the BosWords tournament, fellow puzzlers and PuzzleNationers? Let us know! We’d love to hear from you! Delving into the BosWords puzzles! I finally had a chance to sit down and try my hands at the puzzles from the BosWords Crossword Tournament earlier this month. Given the talent involved, I had high expectations, and I was not disappointed. So let’s put them under the microscope and see what’s what! The unscored opening puzzle in this year’s tournament was a warm-up to get everyone in the mood to solve. Its theme was simple and accessible: The circled letters in each long answer — the first two letters and the last two letters — spelled a synonym for “friend” (DU and DE in DUAL ACTION BLADE). Interesting grid entries included OLD ELI, TREVOR NOAH, LEMUR, and PONY UP, and my favorite clues were “One taken for a ride” for SAP and “Luke Skywalker saw two from Tatooine” for SUNS. A very smooth, very fair solving experience, Puzzle 1 is exactly what the first scored puzzle of a tournament should be. It sets the tone, the difficulty, and whets your appetite for more. The clever use of SCHOOL’S OUT as a revealer for the game — phrases where SCHOOL has been swapped for OUT, as in SECONDARY OUT — even has the pleasant side effect of getting the song stuck in your head. Interesting grid entries included TROTSKY, CAT SCAN, and X FACTOR, and my favorite clues were “‘Ghostbusters’ vehicle, before it was Ecto-1″ for HEARSE and “They might get smashed at parties” for PINATA. I have no notes for Puzzle 2, because it wasn’t included in my Solve at Home packet. The puzzle, constructed by Andrew Kingsley and John Lieb, was used in the tournament with Will Shortz’s permission (as it was already earmarked for The New York Times). The puzzle was published on Wednesday, August 16, if you’re interested. It appears that Puzzle 3 will be BosWords’s version of the American Crossword Puzzle Tournament’s infamous Puzzle 5, as this was the toughest themed puzzle in the set. However, as you’d expect from a Quigley puzzle, there was lots of intriguing fill, and a diabolical theme: long phrases that included the name of a college, but the college was swapped with the name of another college in another themed entry. For instance, the answer THIN WHITE RICE would normally read THIN WHITE DUKE, but Duke was transferred to another line, where instead of BROWN-EYED GIRL, the answer was DUKE-EYED GIRL. All four theme entries had the name of a different college substituted in for the college that would normally appear in that phrase. I confess, it took me a while to unravel just how this theme worked. Factor in the longer fill entries crossing those themed entries, and you’ve got a tough, topnotch puzzle. Interesting grid entries included MALFOYS, DAME EDNA, CASSINI, DEEP FRYER, and EPONYM, and my favorite clues were “Egg foo yung, essentially” for OMELET and “It may be used by Colonel Mustard” for ROPE. Interesting grid entries included MONSANTO, FAN MAIL, BANFF, and HOHOS, and my favorite clues were “Paper tigers, perhaps” for ORIGAMI and “Long line at a wedding reception?” for CONGA. This themeless puzzle — intended to settle any ties going into the final — had some impressively long entries crossing at the corners, making for a great solve overall. Interesting grid entries included CRAPSHOOT, RECHERCHE, PLOT TWIST, EVANESCE, POKEMON, and ARIGATO, and my favorite clues were “Paris was too much for him” for ACHILLES and “Set back?” for SCENERY. A themeless challenging enough to rival Quigley’s themed Puzzle 3, this tournament closer was well constructed and engaging, really testing solvers’ creativity, wordplay, and vocabulary. I don’t think I would have completed it in the time allotted, let alone fast enough to do well against fellow solvers. Interesting grid entries included BINGE WATCH, IN LALALAND, DADBOD, TRUMP U, and TEA CADDY, and my favorite clues were “Eventful activities?” for DECATHLONS, “Common note designee” for SELF, and “Floral drawing?” for NECTAR. There was also a fun, themed bonus puzzle, You’ll Have to Be There by John Lieb, included for At Home solvers, which serves as either a nice closer to the day’s solving or a second warm-up puzzle. Overall, I was fairly impressed by the puzzles offered at BosWords. They weren’t as freewheeling as the ones typically offered at The Indie 500 or Lollapuzzoola. But they were a little bit easier than the offerings at The American Crossword Puzzle Tournament, which makes this a wonderful intermediate-difficulty event to introduce new solvers to a timed, tournament environment. It seems like the right mix of challenge and creativity for solvers accustomed to NYT-style solving, and I think the constructors and organizers did one heck of a job putting together the tournament. Here’s hoping next year’s BosWords is an even greater success. The BosWords Crossword Tournament This Weekend! 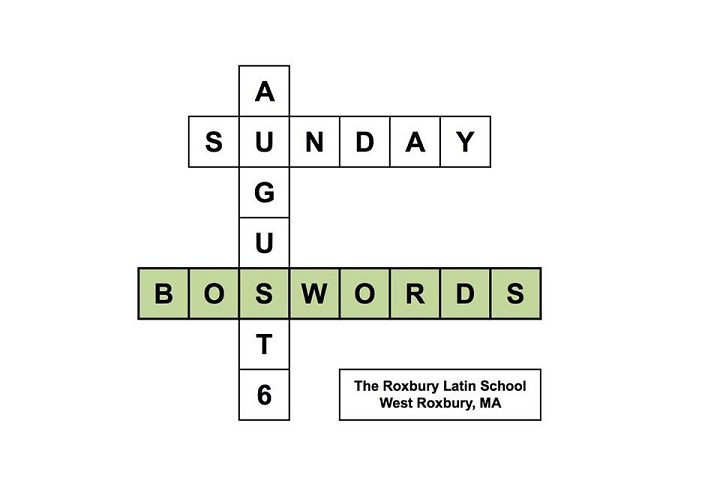 This Sunday, August 6, from noon to 5 PM, puzzlers from all over will gather at The Roxbury Latin School in West Roxbury, Massachusetts for the inaugural edition of the BosWords Tournament! BosWords is asking for $20 for adults and $10 for students to attend and compete, which is a real bargain!. Crossword fans, be aware! There are TWO crossword tournaments looming in the near future! The first is a newcomer to the crossword scene, the BosWords Tournament! Sunday, August 6, marks the inaugural event, and registration is officially open! The format is simple. Three divisions — Expert, Amateur, and Pairs (allowing you to team up to solve) — pit their puzzly minds against clever clues and crafty constructors. Competitors will complete four themed puzzles made by constructors Laura Braunstein, Andrew Kingsley, John Lieb, Joon Pahk, and Brendan Emmett Quigley, and then the top three solvers will take on a championship themeless by David Quarfoot. And it’s super affordable! BosWords is asking for $20 for adults and $10 for students. That’s a steal! And, of course, it wouldn’t be summer without Lollapuzzoola! And Saturday, August 19, marks the tenth edition of the tournament! The format is similar to BosWords. Competitors are placed in one of three divisions: Express (solvers with tournament experience), Local (other solvers), and Pairs. But if you can’t make it to NYC that weekend, worry not! There’s an At-Home Division that will allow you to participate as if you were there! You’ll get your puzzles by email the day after the actual tournament for a very reasonable $15 fee! Are you planning on attending BosWords, Lollapuzzoola, or solving from home? Let me know! I’d love to hear from you!